A month or so ago, a very generous new friend of ours bought us tickets to a music festival nearby where we would be able to see some of our favorite artists. It wasn’t until a few weeks ago that I even realized it was going to be on Mother’s Day. Soon after Caemon died, I found myself thinking about all the holidays we would be celebrating without him, all those days I once enjoyed I was suddenly dreading. Somehow, I forgot about Mother’s Day. On the long road it took for Jodi and I to become mothers we dreaded Mother’s day. For a couple of years, this holiday was a painful one, for we so longed to join this exclusive club of moms with little ones in tow. In subsequent years, having my baby boy in my arms or a toddler on my hip proved good salve for that old self as I easily immersed myself in being Caemon’s mom. Now with Mother’s Day just a couple of days away, I find myself once again without a child, longing to be a mom, longing especially for my boy. Last year for Mother’s Day, Jodi took Caemon to the drug store to find me a card and a gift. Caemon apparently strayed from the selection of Mother’s Day cards fairly quickly. Instead, he found a card with a drawing of a smiling woman on the front. It was a thank you card. It was perfect, the best card I have ever received. A few days earlier, he and I had sat at our kitchen table and used one of his favorite machines, our label maker, and we made Jodi a special card, complete with a picture of him on the front. We used glue sticks, cut out bits of paper, pulled out some fun stickers. While Jodi and I so delighted in receiving cards that involved his very own decision-making, even better was teaching Caemon the art of giving, seeing his smile filled with pride that he had done something for us. We didn’t need to teach him to appreciate his moms. That was something he did all on his own. The joy and pride we both felt in being Caemon’s moms and in imagining our future together as a family erased any sadness we may have once felt about Mother’s Day. But without him, that old familiar not-a-mom status has returned with a vengeance, and it’s no secret that I hate it. People often assure Jodi and I that we are still mothers even without a child. I absolutely feel like a mother; there is no losing that. However, the work of mothering is no longer part of our lives. Children of friends and family look at me suspiciously when I reach out to touch their sweet little toes or their soft hair. They reach eagerly for their parents if I try to embrace them, quickly wriggle free if I try to pick them up. And they should. I’m not their parent, not their mom, and as far as many of them can see, I’m not a mom at all. If they do reach out for me, if they do offer hugs, it’s not the hug a child gives a mom; it’s the more trepidatious hug reserved for aunts and parents’ friends because, quite simply, I’m not their mom. I’m Aunt Timi, their mom’s friend, a stranger smiling at them in a store, the weird woman in the elevator who compliments a toy or a book they might be holding, the sad woman who always seems to be crying. People say we’re still moms, but we don’t act like moms. We do the sorts of things couples without children do. Jodi and I freely visit restaurants at any time without the slightest concern for how our child will behave. We catch movies or read books, even sleep in late. We drink whenever we want, as much as we want. We place sharp objects within reach, leave candles burning on low surfaces. We get ready to go places in a short time, and we arrive clean, not disheveled, and without a babysitter to call. I know how this sounds. These are all the things we used to pine for as parents, the stuff of dreams when one is mired in the work of parenting small children. This sort of freedom is foreign to parents, but to have such independence to do what we want whenever we want with no reprieve–to never be called back to duty–is awful. Last weekend, we were dining with extended family, and my niece wanted a smoothie. On the menu were mango, banana, strawberry, and other fruits, but when she heard the word “banana,” she thought she heard “vanilla” and thus immediately had her mind set on a vanilla smoothie. When her parents told her they had banana rather than vanilla, she was quite disappointed, so I motioned to the server who was taking our drink orders and whispered to her, “In a moment, I’m going to order a vanilla smoothie. You’re going to write down banana smoothie, but we’re going to call it vanilla.” She smiled, and I informed her in a voice loud enough for my niece to hear that the young lady would be having a vanilla smoothie. My niece beamed, couldn’t believe that I had somehow ordered her something special, and the other adults at the table breathed a sigh of relief that the impending meltdown had been averted. That moment felt good. It felt good until I realized that it’s because I was once a mother who had to trick her son into eating foods he didn’t want to eat from the hospital menu by calling them by more appealing names. I was once a mother. Being a mom was the best thing I’ve ever done. I loved it all, even the hard parts. Every sleepless night was worth the feeling of Caemon’s little arms around my neck, the feel of his sweet little kisses on my cheek, the warmth of his head resting against my chest, the radiant smile he offered me when I came home from running some errands, the sweet scent of the nape of his neck. I miss every moment, even the tantrums, the unwillingness to eat what I’ve cooked, the screaming in public because even though those behaviors may have been challenging, they were the challenges of living and growing and learning to be in the world. 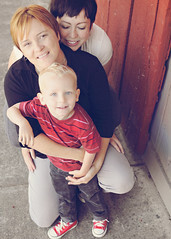 So long as we had those challenges, Caemon was a thriving boy, and Jodi and I were his moms. Without the challenges and the triumphs of the daily mothering of our boy, I don’t know what we are. We’re not actively mothers right now, but we’re not not mothers. That there is no word for what we are says something about the unspeakable nature of losing one’s child and the particular grief of losing one’s only child. It is unspeakable, unthinkable. There quite literally are no words. As people who spend a lot of their lives thinking about words and language, we have naturally discussed this horrible limbo with friends. A few hours after one such conversation, my friend texted me with this suggestion: “How about, ‘once and future mothers’?” Yes. Yes, I suppose that’s us. We do pine for another child to parent, and we will have one–we will be mothers again. I don’t know what that will look like; it’s hard to see much of anything from this in-between world filled with longing and sorrow for my only son, but children have a way of illuminating even the darkest of places. Last week as I held my newest baby niece for the first time, I caught a glimpse of that–that healing capacity with which babies are born. When we went to a bereaved family camp a couple of weeks ago, we met another two-mom family who had lost their first child fifteen years ago. They had two more children after that child died, two beautiful, sweet, kind, healthy children whose daily lives have included their moms’ memories of their older sister–a sister they seem to know. The children hadn’t taken away the pain of losing their first child, but they had brought their parents the joy that accompanies children. Jodi and I could easily see ourselves in these moms’ shoes: future mothers. Being Caemon’s mom was the best thing I’ve ever done, and now that I can’t mother him, I often feel I’m walking around in ill-fitting clothes, sleeping in the wrong house, driving the wrong car, living the wrong life. I’m living the once-a-mother life waiting for the universe to right itself again. I know I can’t have him back, and I know I’ll never be the same, but sometimes the idea of future motherhood is just enough to keep me going. Images courtesy of In Her Image Photography. This entry was posted in grief, life after Caemon, moms and tagged grieving parents on May 10, 2013 by T.
thank you for sharing your thoughts about facing this weekend and about your mothering future. xoxoxo. Thank you! I came across your site for another reason, and can not express how much it touched me… your recent post finally puts to words the emotional struggle I have felt and continue feel and have never been able to verbalize. so glad your gonna be near music and perhaps smaller kids you can oogle and love. MY son is 18 and looked quite like your boy as a little one. I am with you two in spirit and know another little one will bless you soon. Your words continue to inspire me, remind me what I should treasure and what I should let go of, and give me hope, Timaree. I am so blessed to be the mother of three precious, healthy children, and to have my own mom alive and healthy. I hope that somehow we can all be blessed because there are mothers in the world — mothers with babies, mothers with teenagers, mothers without their children, mothers with someone else’s children, and mothers with a seemingly endless supply of love, like you two…Thank you for what you have given me. I think of you three often, keeping you in my heart especially this Mother’s Day. This is beautiful. Thank you for sharing your words. You are both constantly in my thoughts. The firsts, and there are so many of them, are so very, very hard. I relate it to a crash test dummy. You never know when something’s going to smack you one, and you have no say in the matter. And yes there is no word for those who inhabit our world because it is beyond words. I refer to myself as a childless mother. I drive form checkers mad because I also refuse to tick the widow box, I tell ’em I’m a married woman whose husband is dead. I refuse to wear the mantle of widow. Death will never define me. I will be thinking of you both on Sunday. Take care of each other. So beautifully expressed. Thank you, on behalf of once, current and future mothers everywhere. Happy Mother’s Day to each of you. Not sure if you’ve heard of this organization, but they are supposed to be pretty phenomenal. The thought of you having another baby makes me so happy – even though I don’t know you. You were both so good at it. Caemon was lucky to have mommies that loved him so much. In German we call it orphaned parents. Even though others don’t see your son, he is always with you. You will always be a mother no matter if he is with you or not! Happy Mother’s Day to Both of you! I think alot about the kind of mother I would like to be these days – and that makes me think of you. Sending love your way…. This was a beautiful post and I don’t have any words that can do it justice. Thinking of you. Thinking of you as a mother. Former. Current. Future. Forever. I just wanted to let you know that you both have been in my thoughts today.